Social media is a great place to find incorrect grammar. People typing quickly are more prone to make mistakes. There may be no better place than Facebook and Twitter to find grammar errors. There are always plenty of social media users waiting to pounce on people making grammar and spelling mistakes. This has led to the rise of memes like the Grammar Police and Grammar Nazi. Grammar is important but too much grammar criticism disrupts threads and can lead to embarrassment, especially on Twitter where it is currently not possible to edit a tweet. Grammar Police and Grammar Nazis are determined to correct your grammar with the Grammar Nazi being the most fanatical. The Grammar Nazi has a sideways G emblem. The Know Your Meme site traces the origin of the Grammar Nazi to a post on the newsgroup: newsgroup.alt.gothic on January 19, 1995. The listing also says the terms Grammar Police and Grammar Nazi hav a negative connotation. Pointing out grammar errors can be done politely or in jest but with grammar police it tends to take on a trollish level of behavior. The frequency with which it is done tends to annoy rather than invoke laughter. It may also be done in an overly harsh manner. The grammar trolling that began on Usenet expanded to social media and can be found on Facebook, Twitter, YouTube, Instagram, Tumblr and other social media platforms. You can see some Grammar Nazi imagery and create your own memes here on Imgflip. There is an even a Grammar Borg. The Urban Dictionary entry for "Grammar Nazi" says there are different levels of GNs. Grammar Police are noteworthy for their relentless drubbing of users for incorrect grammar and typos of all kinds, but sometimes it is meant to be humorous. 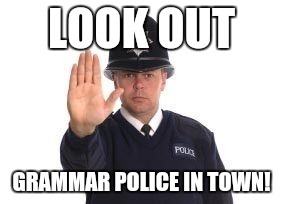 People use the Grammar Police and Grammar Nazi memes as a way to hit back at people that are overly concerned with spelling and punctuation errors. The Correction Guy meme is another common grammar meme. It is similar to the concept behind Grammar Police and Grammar Nazis. The Correction Guy is also used to point out mistakes. He has his hand up as if to say "stop" or "slow down." There are even Twitter accounts dedicated to particular spelling errors, such as @StealthMountain. When it was operational it would notify Twitter users when they used the wrong spelling of peek. Steal Mountain says, "I alert twitter users that they typed sneak peak when they meant sneak peek. I live a sad life." Steal Mountain helped point out an error that people make frequently without realizing it. Cats also play a role in some grammar memes as they do in most Internet memes. Some of these show cats in the Grammar Nazi outfit while others show cats infuriated by improper grammar. There are also memes that spread about ignoring bad grammar. People don't interfere on Twitter by interrupting a thread to point out a spelling mistake or the misuse of a word but they are still bothered by it. This has led to saying like, "I'm silently correcting your grammar." The phrase is seen on many mugs and t-shirts sold online. Other popular sayings include "commas save lives" and "punctuation saves lives." You can find some grammar meme imagery on Google Images and Pinterest. For more on writing-related memes check out our writing memes section.